Who knew Henninger and Liverpool could blend so well. 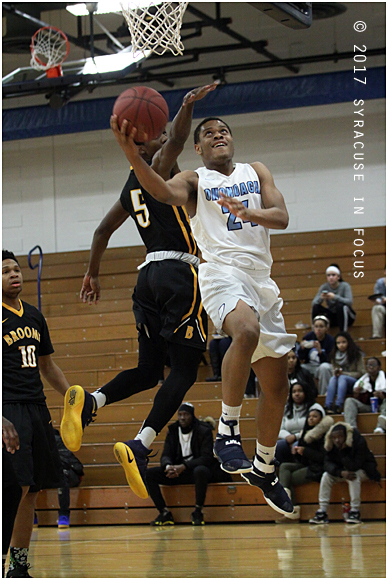 It has been fun to watch the progressive chemistry between the SUNY OCC duo of Quantae Elijah (Henninger) and Tyler Sullivan (Liverpool). These days they go together like beans and cornbread. The game narrative goes something like this: Sullivan swishes from deep (as well as getting to the line often) while Elijah plays ball hawk on the opposing point guard and keeps pressure on the defense by constantly driving to the bucket. 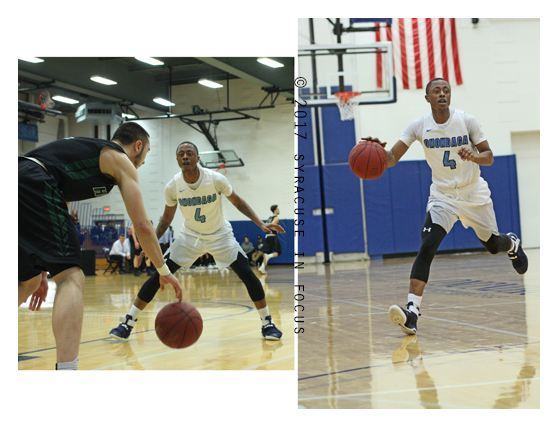 Last night, the freshman guards combined for 43 points in the teams 97-95 victory over Hudson Valley Community College. Four other players also finished in double figures. 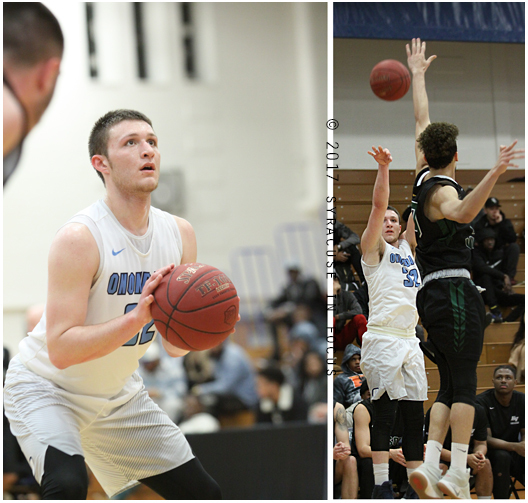 The OCC backcourt logged a lot of minutes for coach Erik Saroney (40 minutes for Sullivan and 34 for Elijah), but the victory and rest will be short-lived; their next game will be a NJCAA regional game on Saturday. Shemere Elliot went 7 for 7 from the field last night, and scored 16 points. 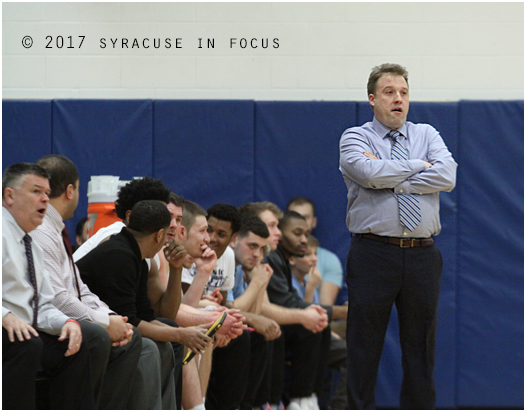 Former Henninger coach Erik Saroney won over 200 games in Section III, including multiple championships. He has put together a great inaugural season on the other Hill behind an uptempo, pressing style that has become a trademark of his former clubs. Behind local standouts such as Tyler Sullivan, James Walker and Quantae Elijah, OCC is now 20-6 overall and 6-2 in conference. 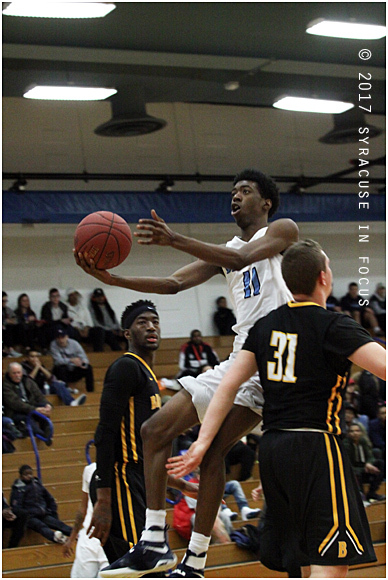 They defeated SUNY Broome Community College last night 111-65. Their next game is against Jefferson Community College on Friday. James Walker finished with 16 points and 8 rebounds. 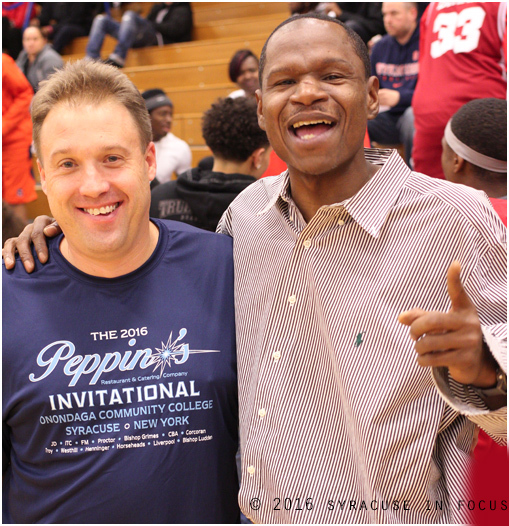 Good Knights: OCC Men’s Basketball Coach Erik Saroney (left) and Henninger High Boys Basketball Coach Gil Spaights had a mini reunion at the Peppino’s Tournament on Saturday evening before the Henninger v. Horseheads contest at OCC. Both men are in their inaugural seasons. Spaights was an assistant coach when Sarnony was at Henninger.